Corrosion is an expensive and potentially dangerous problem in many industries. The potential application of different nanostructured materials in corrosion protection, prevention and control is a subject of increasing interest. Corrosion protection and control using nanomaterials explores the potential use of nanotechnology in corrosion control. The book is divided into two parts. Part one looks at the fundamentals of corrosion behaviour and the manufacture of nanocrystalline materials. Chapters discuss the impact of nanotechnology in reducing corrosion cost, and investigate the influence of various factors including thermodynamics, kinetics and grain size on the corrosion behaviour of nanocrystalline materials. There are also chapters on electrodeposition and the corrosion behaviour of electrodeposited nanocrystalline materials. Part two provides a series of case studies of applications of nanomaterials in corrosion control. Chapters review oxidation protection using nanocrystalline structures at various temperatures, sol- gel and self-healing nanocoatings and the use of nanoreservoirs and polymer nanocomposites in corrosion control. 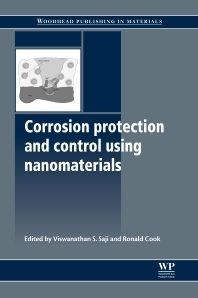 With its distinguished editors and international team of expert contributors, Corrosion protection and control using nanomaterials is an invaluable reference tool for researchers and engineers working with nanomaterials in a variety of industries including, aerospace, automotive and chemical engineering as well as academics studying the unique protection and control offered by nanomaterials against corrosion. Dr Viswanathan S. Saji works in the Department of Advanced Materials Chemistry in Korea University, South Korea. Dr. Ronald Cook works at TDA Research, Inc, USA. SmithKline Beecham Pharmaceuticals, Epsom, Surrey, U.K.